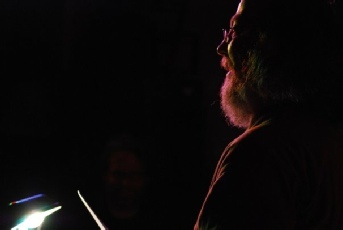 Poetry Reading also featuring Ken Feltges and musician Kathy Moriarty. 7:00 - 9:00 PM $4.00 admission includes refreshments. Oral Memoir performance - 2:00 PM. Genesee Reading Series along with Miriam Lerner. Poetry Reading Time to be announced. Poetry Reading, along with Charles Case. "Lyric Visions: Artists Respond to Poetry"
This event is co-sponsored by Poets & Writers, Inc. through public funds it has received from the New York State Council on the Arts. Multi-media program about the coast of Maine. Feeling our connection with nature through, rhythms, words and photos. Special Children's Presentation of "All One Song"
Sunday Service "It Hangs Over Our Left Shoulder"
"See, It Was Like This" Oral Memoir. Six Gallery Reading in San Francisco. Poetic Conversation along with Charlie Rossiter and Craig Czury. Genesee Reading Series along with Steve Coffman. Celebrating the 20th Anniversary of the Watkins Glen Reading Series! Saturday, September 27, October 4, 18, 25,29 and November 22. A Friday evening Oral memoir Performance followed by a Palm of the Hand Workshop Saturday morning or early afternoon. I'll be one of 14 featured poets followed by an open reading. Reading and Workshop. Details forthcoming. Poetry Reading also featuring Martha Deed. a talk on the history of FootHills Publishing. Poetry reading to benefit the Helen Rubar Peace Scholarship. Also featuring Martha Treichler and Steve Coffman. 50% of all book sales support the scholarship. Poetry reading followed by an Open Reading. Poetry reading with Charlie Rossiter. Poetry Reading along with Susan Deer Cloud. "Poetry as a Way of Life." Poetry reading and talk. "See, It Was Like This"
Stories from mid-60s through early 70s. Saturday, October 13, 9:00 AM - Noon. "Stories and Poems from the Road"
fiction writer Susannah Risley and me. "See, It Was Like This. . ."
Crisscrossing America - Stories and poems from 4 decades of traveling. Oral Memoir of growing up in the 60s. US 20 Journey - Photos, haiku and stories. it has received from the New York State Council on the Arts.